Geoff Billington started riding at the age of nine. His parents were not horsey, however Geoff says "he followed a group pretty girls and finished up at the local riding stables!!! !” It’s there that his love affair with horses began. Ten children, nine girls and Geoff, announced in the local newspaper that they were saving up to buy a pony, a childhood fantasy. That samer day a local man rang up and said his children were not interested in the surprise 4 year old pony he had bought them and if they gave £10 to charity they could have the pony. So only £1 each. Geoff laugh’s, within a few weeks, my sisters had either got boyfriends or lost interest so I got my first Pony!!! I loved watching the Showjumping on television, my favourites, were Harvey Smith and David Broome. After teaching myself and Sandstorm to jump, we started to hitch lifts to shows. Geoff recalls, "one of my first rivalries was with a milkman’s son from Huddersfield, he was the same age as me, he was very quiet, very stubborn and a steely determination to win. Geoff laugh’s. His name was John Whitaker! On leaving school, Geoff went to work for a Manchester night club owner, called Joe Pullen, he owned showjumper’s for David Bowen and Graham Fletcher. Joe gave Geoff the ride on a horse named after his night club, Talk Of The North and at 19 years of age Geoff competed on his first British Team competition in Poland. 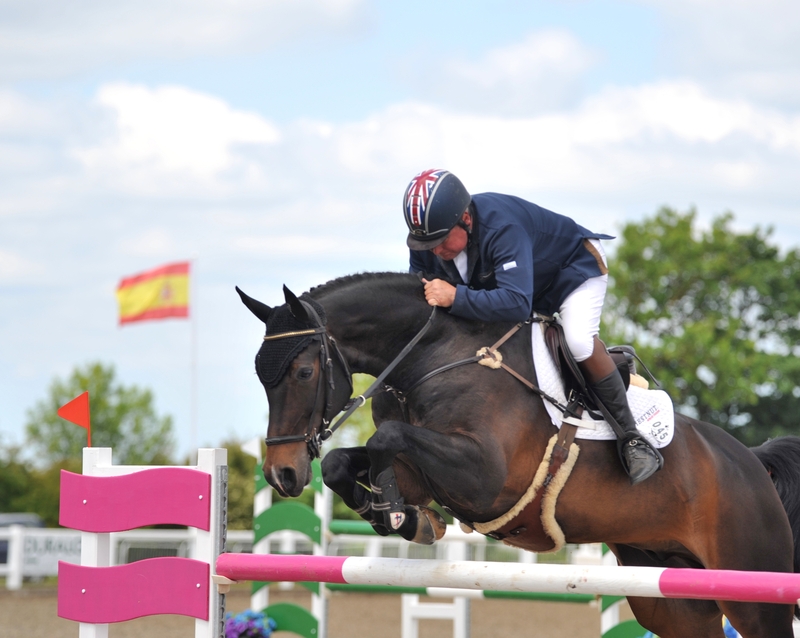 He has since ridden in over Fifty Nations Cups for his country. Geoff says, throughout my career I’d had some fantastic horses and owners. But in 1992 a long time owner sent me a novice 6 year old horse that changed my life. His name was 'It’s Otto'. He was to become one of the best horses in the world. He kept me in the top ten in the world for over two years. In 1996 we were selected for the Atlanta Olympic Games where we came 6th individually. In 1997 we had a team Bronze at the European Championships, in Manheim 1998 another team Bronze and Bronze at the Word Championships in Rome, 1999 and in the European Championships at Hickstead we were 6th individually. Then in 2000 we were selected for the Olympic Games in Sydney. Phew what a horse! Nowadays Geoff still competes. He does lots of coaching and clinics all round the country, Commentry at a few of the top shows all the while producing, buying and selling horses, not to mention, his hilarious after dinner speeches. When we asked Geoff to sum up his life in Showjumping, he says, he wouldn't change one thing, "how many people can say their hobby is their job".... "growing up and going on tour with your mates every week", especially when the mates have been John and Michael Whitaker plus Olympic Individual Champion, Nick Skelton!! !